A holiday in Gran Canaria is probably your best bet for a sunny and warm Christmas, along with the rest of the Canary Islands, which have the best climate in Europe during winter. If you want to know more about it read further regarding the hottest Canary Island, to get a better sense of how warm you can expect the weather to be during the winter months. Will it be warm enough to spend Christmas day at the beach? Can you swim in the ocean on Christmas in Gran Canaria? We get these types of questions all the type and it's usually from visitors who are coming for the first time to the island or maybe it's their first visit during a winter month. Although the Canary Islands have a very mild winter, with temperatures usually in their mid 20s during the daytime, nobody can predict the weather accurately, especially several months in advance, given all the climate changes happening around the globe. But you do have great chances to swim in the ocean if you're spending Christmas in Gran Canaria, although you can expect the water temperature to be around 17 - 19 Celsius, so a bit chilly, but definitely doable if you want to want to have a splash. You could also do some shopping a few days before Christmas and then take your friends or family for a picnic on the beach, as this definitely be an experience to remember, something very different compared to a Christmas at home. In 2016 there was even a Christmas market in Maspalomas, so that's another idea for a trip while on holiday. 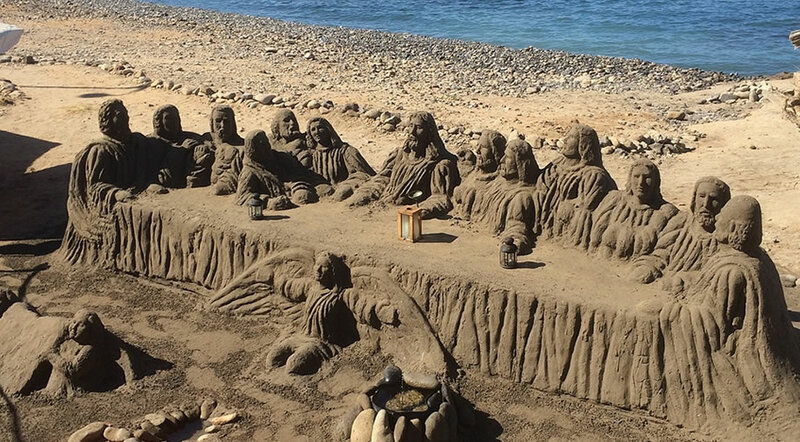 Sculptors from all over the world are participating in the creation of all the sand sculptures on the beach of Las Canteras and the Belen de Arena have become a symbol of the island around the holiday season. You can see some of these sculptures in the photo above, but there are many more and some of them are really spectacular. At a time of the year when other people are going to stay in ice hotels, you can come to Gran Canaria and walk in flip flops around sand sculptures. The city council of Las Palmas has published a program of all the activities in the month of December - see HERE the entire schedule. Since Gran Canaria is an island based on tourism, Christmas means it's business as usual for bars and restaurants, so you can expect to have a lot of options, not just the traditional English food that is usually served on Christmas. 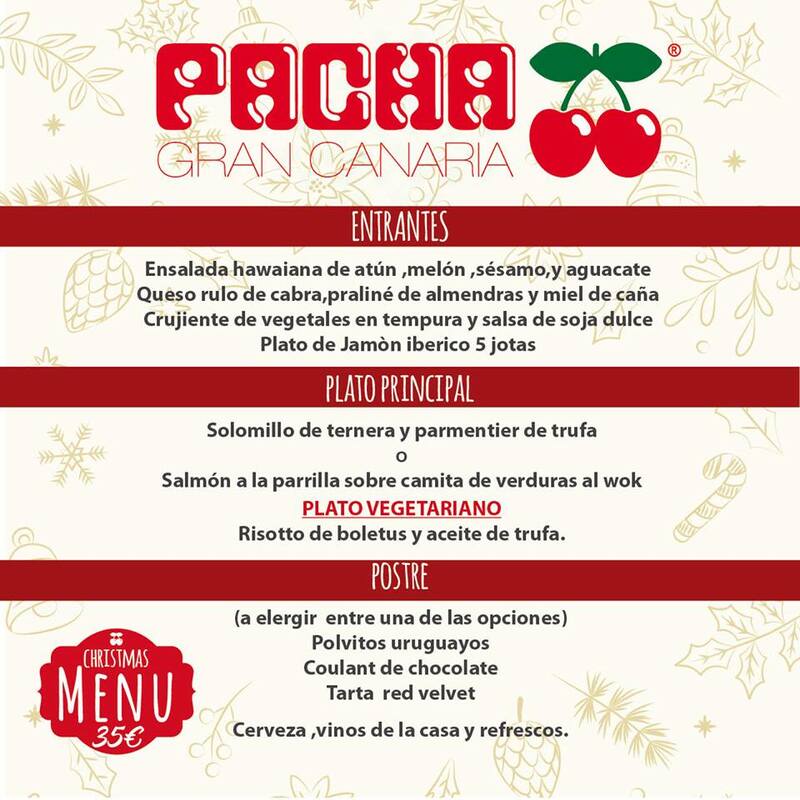 Price for this menu 69 € wine package 39€ +7% i.g.i.c. 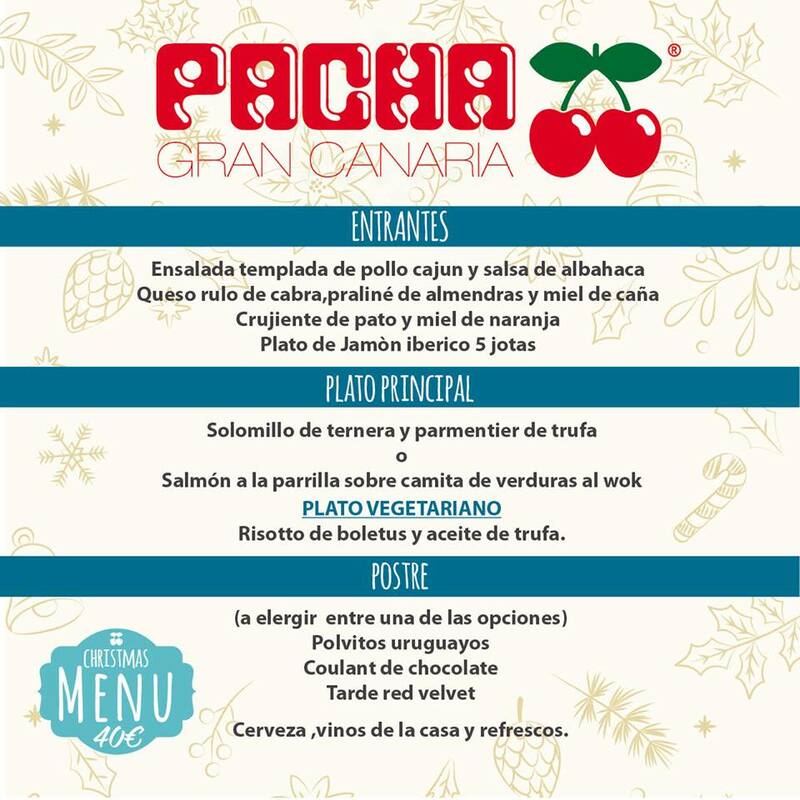 There 2 menu options for Christmas at Pacha: one menu for 35 euros and one menu for 40 euros per person. This page will be updated as soon as we have more info about events and things to do in Gran Canaria at Christmas. RESTAURANT OWNERS: If your place has a special menu for Christmas day please just send us a message on Facebook or an e-mail with your info/menu and we will add it to our page! Please help us share this message and reach local businesses!